Who knew that director Guillermo del Toro (Pan’s Labyrynth, Hellboy) was the elect who would bring us the summer blockbuster that would be a clear alternative to Michael Bay’s disastrous Transformers? I, for one, am not in the least surprised that del Toro was the talent behind this dazzling sci-fi. 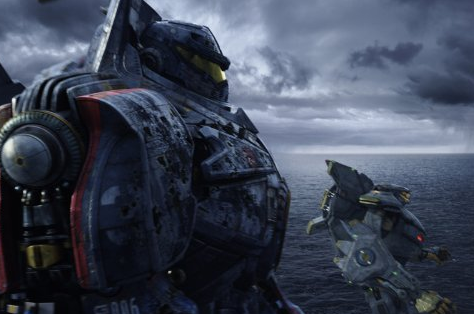 Even as an ode to the Godzilla and Japanese monster movies that came before it, Pacific Rim still stands in his own category. In a summer of knock-offs, this one is a fresh piece co-written by de Toro and Travis Beachman that should rightly make all these regurgitations jealous. In the 2020s, dimensional-traveling alien beasts (called Kaijus) of furious intentions and daunting size come through a portal beneath the Pacific Ocean and begin attacking cities worldwide. When the attacks keep coming, the armed forces of the world must put their resources together to amass huge fighting machines (referred to as Jaegers) to more effectively combat their new enemies. After a battle with a creature costs the life his brother, a washed-up “Raleigh Becket” (Charlie “Sons of Anarchy” Hunnam) is found five years later by his former commanding officer “Stacker Pentecost” (Idris Elba) and persuaded to give defending earth another try. When he reenlists, his new co-pilot is “Mako Mori” (Rinko “Babel” Kikuchi) who lost her family in a Kaiju attack. She seems a perfect match for him. But with a new team that doesn't yet know or trust him and with the government considering liquidating the Jaeger Project altogether to provide a more effective attack strategy, Pentecost is preparing the team for an increasingly brutal alien resistance and everyone is feeling the tension. As the fate of the world rests in their hands, what we feel is the affect of a great and novel sci-fi that has us ready to answer that most obvious of questions that most will have going in: how interesting can a monster movie possibly be? The answer: very! 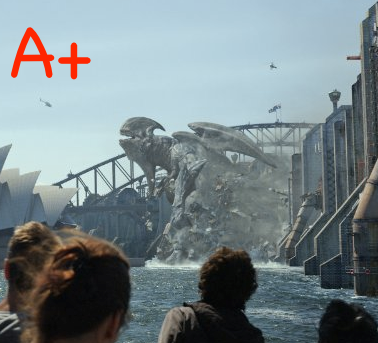 As stated, Pacific Rim is America’s answer to Transformers. While both deal with massive machines doing battle, this one has a story that equals or surpasses what incredible CGI-embellished action it offers. And unlike so many films (and commercials and TV shows) that seem forced when they incorporate diversity, the fluidity of this film’s incorporation of a united world is more than amazing. It demonstrates natural (non-statement-making) diversity on a global scale. 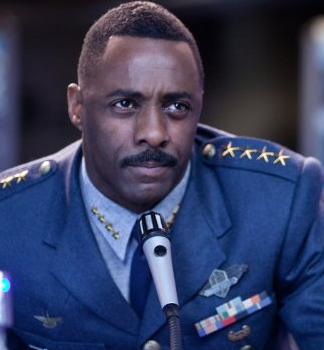 PR’s cast is another of its great strengths with Idris Elba being one of the best reasons to see this film. His commanding presence makes us not only respect him, but be in awe of what his character brings us. 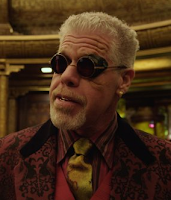 Charlie Day (“It’s Always Sunny in Philadelphia”) and Burn Gorman (“The Dark Knight Rises”) play two whacked-out, bumbling scientists that at first we aren't ready for, but with Ron Perlman as the inexplicably comical leader of a street crime syndicate, we at last jump on board with what del Toro wanted to do. Acting in PR is excellent all-round. Hunnam and Kikuchi are not only ripe with resplendent personal chemistry for one another, but neither are hard on the eyes. They are two more great reasons to see this film. And let it be noted that at no time does Kikuchi resort to the typical showing of cleavage to score points with the audience. We respect her fully clothed, and in a fight. With a lot of structural elements from 1996’s Independence Day, PR is a rather long movie, but with lots of delicious carnage (and noise to go with) and a thick story that has the slowly expanding emotional impact of a TV drama. Intelligent viewers enjoy as it should easily accommodate a wide age range of viewers—without the stupid teen drek. And while the whole affair may have us backing up to ask one big question (wouldn’t it be much more efficient to invent more powerful and accurate missiles instead of fighting robots to box it out?) it is still a more than worthy sci-fi addition that is as much into awesomeness as the next film only wants to be.